I'm a three-year-old British Shorthair boy. Yes, a boy. (Don't be fooled by the eyeliner.) I enjoy canned tuna and long walks on the countertops. Please don't tell my mom about that last part. I was born in the United States on March 23rd, 2015. I currently live in California, where I've been venturing outside and enjoying the temperate climate. See below for the first pic my mom ever saw of me. It was love at first sight! 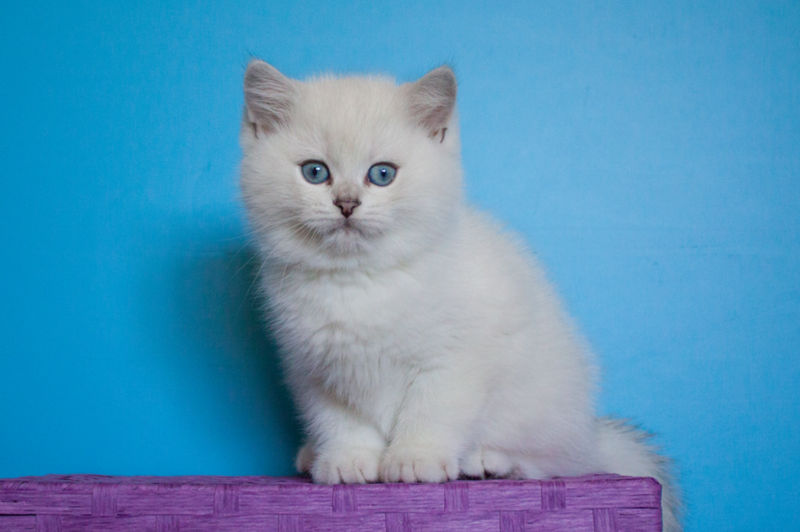 I'm a silver-shaded British Shorthair. I might appear all white at first glance, but I have lots of dark accents on my eyes, nose, feet, and tail. My breed is known for being intelligent and loyal. I like to think I live up to that reputation. I'm playful, sassy, and affectionate—if you deserve it and/or treats are involved. I love to snuggle, steal the covers, and play hide and seek. I take food very seriously, and I can get a bit testy if my meals aren't served on time. Unlike other cats, I enjoy the water; particularly splashing in it and watching my mom clean it up. I like to pose and strut my fluff for the camera. But only on my terms. How'd you get YOUR name? I got my name Coby because of my cobalt blue eyes. My mom fell in love with them the moment she met me. I also respond to several nicknames, such as Cobes, Coby Baby, and Cobe-mister. I do not respond to Chubster, Cottonball, or Cobzilla. I must confess, he-who-shall-not-be-named (AKA the vet) told me I could stand to lose a couple pounds. What can I say, food is why I get up in the morning. So my mom currently has me on a diet plan that includes low-carb meals and a food puzzle (evidence below). I'll keep you posted on my progress. In the meantime, please send treats. Food puzzle diet: Day 1.